BC auto insurance laws don’t make it easy to keep your insurance rates rock bottom. In fact, the latest report about ICBC admits your rates could climb 42% in the next 5 years. And if you’re driving a Porsche or Lamborghini, you can’t get auto insurance through public insurance any longer. Too costly for the government who are strapped for cash. “ICBC needs to save to avoid the worst-case scenario that it reluctantly released Wednesday, showing basic rate hikes climbing by as high as 42 per cent, compounded, over the next five years” from a new report in the Vancouver Sun. Living in greater Vancouver is costly enough without paying out thousands more for auto insurance. And how often have you made a claim on your car or truck? It doesn’t seem fair. For most of us car insurance is a loss which is why we see it as a commodity. But seeing it that way has a danger — that you take it for granted that you can’t get better rates by switching auto insurance companies. US drivers, check out: Seattle car insurance, Chicago car insurance, San Francisco car insurance, Denver auto insurance and Portland auto insurance quotes designed solely for you. When you shop for car insurance, you’re basically preparing to switch insurers in order to save. And as this post on saving on car insurance points out, you can save as much as $1700 a month in some cases. But if you only save $600 a year, isn’t it worth it. 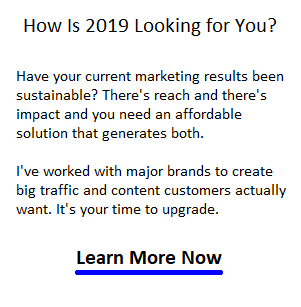 $600 x 10 years – $6000. Most drivers don’t draw out calculations over a decade, yet 10 years does pass and you’ll be looking back at where you lost your money. In fact, you’re leaking money at every hour of the day. It’s time to take control and cut back on some of these costs. There’s no reward for making Geico, Allstate, RBC, TD, Progressive, or other big insurance companies rich. It’s just money out of your pocket. And the only power you have is to use these insurance savings tips, plus get quotes from ten different insurance providers. You’ll create a policy just for you at a much lower rate. So that’s it Vancouver drivers, you create your own insurance rate. Make sure you use above insurance savings tips to get the lowest quote possible. How to Save Thousands on your auto insurance? 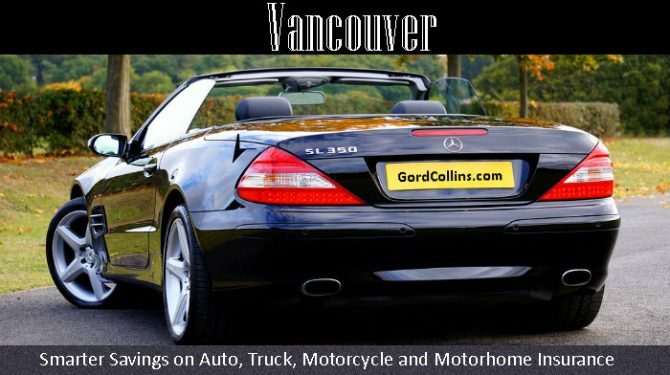 The Top Driving Tip For Vancouver Area Drivers? 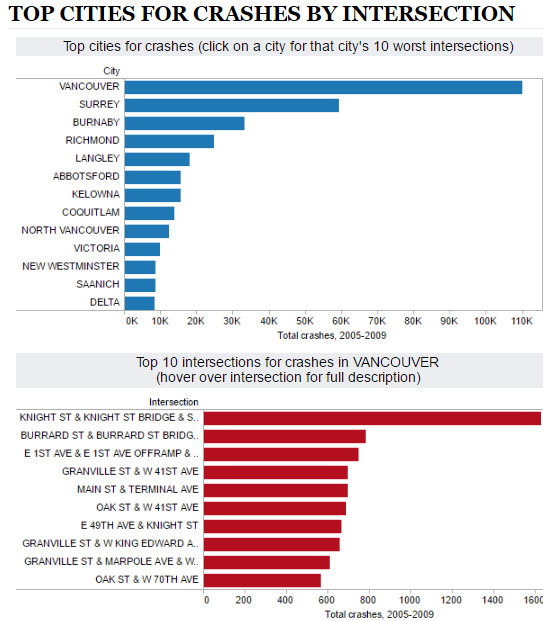 Avoid the worst intersections in Vancouver, Burnaby, Richmond, Langley, Abbotsford, Surrey, Coquitlam, that create the most accidents. See this graphic from the Vancouver Sun and read the horrible reports on their site. Vancouver’s Worst Intersection: The Willingdon interchange in Burnaby has the dubious distinction of being the most crash-prone location in all of B.C. 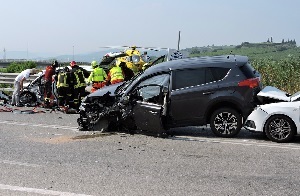 Over a 5 year period there were nearly 2,200 collisions in that one spot, of that, about 900 resulted in physical injuries to drivers and passengers. How to save on car insurance in Vancouver? Avoid the bad intersections. Did You Know You can get a copy of Your Driving Record? Wondering why your auto insurance quotes aren’t low? See what the insurance companies will see after they give you an initial quote. Your driving record (driver’s abstract) is a record of your driving history, when your driver’s licence was first issued, plus any driving tickets/offences that occured in the last 5 years. You can apply for it online at BCIC.com. Wanting to move to Vancouver? Real estate prices here have rocketed in the last 6 years, but have levelled off of recent. Vancouver, Burnaby, Coquitlam, Richmond, and Surrey are very desirable places to live and there isn’t much land to build on. That’s why the price of your home in greater Vancouver will never drop. Whether it’s luxury condos in Richmond or downtown Vancouver, or a house in North Vancouver, the demand to live here will never go away. The fact is, Vancouver was rated as the best city in the world. Controlling immigration is primarily done through high housing costs. Vancouver is for the wealthy so be prepared to pay above one million for just about any property. Compare Vancouver income property to that of best cities in US to invest. There are big changes coming in auto insurance. Self-driving cars may not get along well with motorcycles or other human driven vehicles, and given the way BC legislation is drawn up quickly, drivers could be in for a tough go in 5 years. There will be pressure to rate drivers according to how they actually drive. Those who want lower auto insurance rates will demand it. And self-driving cars will require no driver’s insurance. Technology is pervasive and invading every aspect of our lives. It’s arrived in auto insurance and Millennial aged drivers are showing an acceptance of it. Is it wise or the road we should not go down. Learn more about telematics and car insurance.